The first time I came across Allan Linders work was in 2012 when he released his neo-noir sci-fi epic Prisoner of the Mind. My mind was blown by his approach to comics at the time. He managed to mix in his fine art skills into sequential comic art to produce something that’s really original. I love his artwork and his comics are like reading through an anthology of fine art. 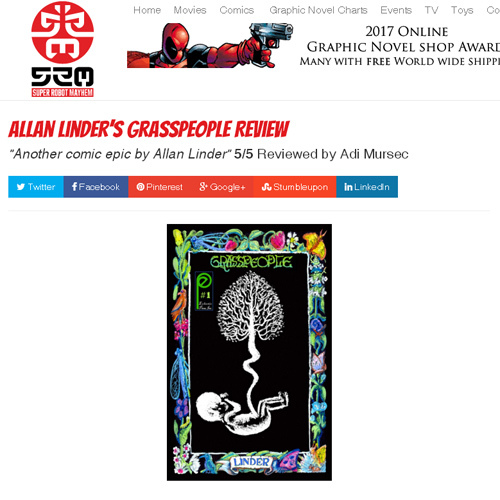 If you haven’t come by Allan Linder before he’s a life long artist who has galleries of his work all over the world and is currently based in New York working on all sorts of projects from paintings to story boards and making awesome comics. Compared to Prisoner of the Mind this one is very different in the way it’s put together. POM was a black and white Sin City meets Blade Runner setting. Grasspeople is a full color dark fairy tale adventure like Zelda meets Lord of the Rings. The story of Grasspeople follows a boy called Monk and his family who live in a mushroom house in a forest made of grass. One day he comes to the age to follow a rite of passage tradition which goes back generations. On that day it starts off as planned but a very dark force appears and everything Monk loved is taken from him leaving him in his worst nightmare. So far I’ve read the first issue about four times and each time it’s like the artwork changes due to me noticing more and more detail on each page. It’s one of those books that make you wish comics were printed on A1 paper with poster sized pages. The story is very captivating in the way it pulls you in with beautiful artwork and by setting up a classic fairy tale type story and turning into a dark fight for heroes life. This comic is a must read for people who want something different and have a real appreciation for indie comics a cool story and fine art. Putting it in perspective the artists working on comics for the big publishers probably get about a day to digitally make one page where as on this book Allan Linder has spent years getting this story and it’s artwork just the way he wants it. So far I’ve managed to get my hands on an early release copy of the first issue but Grasspeople is set to be a five part mini series which will have an official release date summer 2017. I really can’t wait for issue #2 to see more of his work especially if it’s available in digital too, it’s one of those comics you want to be able to zoom into all the detail. Overall it’s everything I love from indie books, a great stand along story with some amazingly uncompromising artwork which you only get from creator owned original stories. I'll let the review speak for itself. I'm feeling very humbled. Thanks Adi. For more info on Super Robot Mayhem, check out his site here. A site run by fans of all things creative and awesome from comics to movies and games.